Cebu Pacific’s new low-cost long-haul unit plans to initially focus on Middle Eastern and regional markets as it works towards launching services with 436-seat A330-300s by Jul-2013. Dubai will be the Philippine carrier’s first long-haul route and will likely be followed by service to Abu Dhabi, Saudi Arabia and Kuwait in 2014. But Cebu Pacific over the medium to long-term also aims to use its new fleet of A330s to serve Australia and potentially Hawaii. Cebu Pacific will become Asia’s fourth low-cost long-haul carrier, joining Jetstar, AirAsia X and Scoot. But Cebu Pacific is implementing a different strategy with an all-economy product and focus on point-to-point traffic. This reflects the different dynamics of the Philippine market, particularly its large overseas population. Cebu Pacific initially unveiled plans in early 2012 to establish a long-haul unit and acquire at least eight A330-300s. The carrier, which is already the largest domestic carrier in the Philippines and serves about 20 international destinations within Asia with A320 family aircraft, has spent the last year working on its long-haul strategy and network. Dubai was announced on 17-Jan-2013 as its first long-haul destination, with daily service beginning 07-Oct-2013. The general manager of Cebu Pacific’s new long-haul division, Alex Reyes, told CAPA that the carrier will use its first A330-300 to operate regional routes and its second aircraft for Dubai. Cebu Pacific’s first A330-300 is slated to be delivered in Jun-2013 with the second A330-300 to be delivered in Sep-2013. Mr Reyes said the first A330 will be placed into service “as soon as we can” as Cebu Pacific always aims to be efficient. Regional routes will be announced over the next couple of weeks. The first aircraft will continue to operate regional routes as Cebu Pacific builds up its new widebody fleet. For now the fleet plan, which includes an initial fleet of eight A330-300s, envisions one aircraft for regional flights with the other seven aircraft being used for long-haul flights to the Middle East, Australia and potentially Hawaii if the Philippines regains a Category 1 safety rating from the US FAA. Cebu Pacific initially said in early 2012 that it would only use the new widebody fleet on medium/long-haul routes. But the carrier quickly realised that some of its densest regional A320 routes could be better and more economically served by A330s. Cebu Pacific’s two biggest international routes, Manila-Singapore and Manila-Hong Kong, are logical markets to up-gauge some A320 frequencies to the A330-300. Cebu Pacific currently has 32 weekly frequencies between Manila and Singapore and 28 weekly frequencies between Manila and Hong Kong. Both are by far the largest routes based on seat capacity from Manila and are also among the top 20 largest international routes in the world – with Manila-Hong Kong (13th in the world) currently consisting of almost 28,000 weekly one-way seats and Manila-Singapore (16th in the world) currently at almost 26,000 weekly one-way seats. Cebu Pacific currently has a 22% share of seat capacity of the Manila-Singapore market, second to Singapore Airlines (SIA) at 32%, according to Innovata and CAPA data. Cebu Pacific has an 18% share of capacity in the Hong Kong-Manila market, third behind Cathay Pacific Airways at 47% and Philippine Airlines (PAL) at 32%. 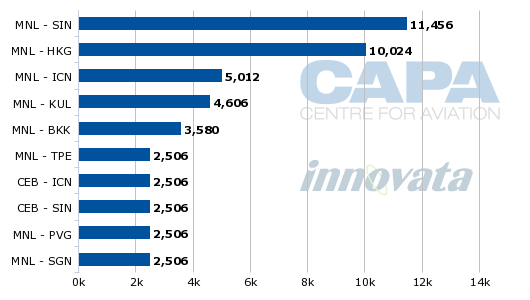 SIA and Cathay already operate widebody aircraft in these markets while PAL only operates widebodies on the Hong Kong route and a mix of A330s and A320s to Singapore. Up-gauging some of its flights to A330s would allow Cebu Pacific to close the gap with its full-service competitors and further reduce its already very low per seat operating costs. Cebu may also use its A330-300s in smaller markets where it can’t expand due to slot restrictions such as Shanghai Pudong. Cebu Pacific currently serves Shanghai with one daily A320 flight. As it would only be able to add a second frequency at a similar middle of the night timing, increasing capacity in Shanghai by up-gauging to an A330 could be an attractive option. Frequency increases rather than gauge changes are more likely at least for now at Cebu Pacific’s three other mainland Chinese markets – Beijing, Guangzhou and Xiamen. These markets are now served with three to four weekly flights in the late evening or middle of the night hours. Manila-Dubai was the most logical first long-haul route for Cebu Pacific as it is the biggest long-haul route from Manila and the seventh largest international route overall based on current seat capacity. Cebu Pacific believes the market is under-served as origin and destination (O&D) passenger data shows that 70% of passenger travelling between Manila and Dubai are flying on one-stop services. Emirates is the only carrier currently operating non-stop flights between Manila and Dubai, offering three daily flights with 777-300ER aircraft. The third daily frequency began on 01-Jan-2013. Etihad also serves Manila from nearby Abu Dhabi with two daily 777-300ER frequencies. While Emirates and Etihad carry on their Manila flights a large volume of Filipinos working in the UAE, the carriers also dedicate a large portion of their Manila capacity to one-stop markets in the Middle East, Africa and Europe. 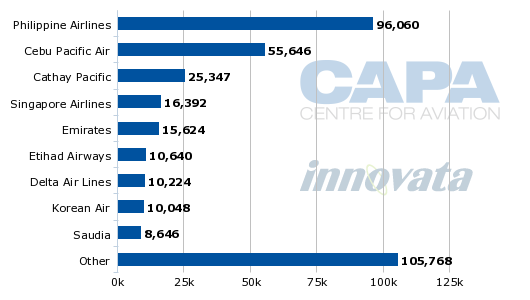 Many of these markets are higher yielding, limiting the number of point-to-point passengers carried. Cebu Pacific will likely not take a large number of passengers from Emirates or Etihad but end up attracting more of the 70% of Dubai-Manila passengers which are now going one-stop by other carriers. Cebu Pacific is also confident it can significantly grow the market by stimulating demand through lower fares. Many of the estimated 700,000 Filipinos working in the UAE only come home for visits every few years but Cebu Pacific believes lower fares will allow them to visit their families more frequently. Cebu Pacific says its regular Manila-Dubai fare is 40% lower than Emirates and its current promotional fare, which starts at PHP6,748 one-way (USD166) including the fuel surcharge and PHP1,350 (USD33) in ancillaries, is 68% lower. In recent years Cebu Pacific has seen how its low fares can stimulate more frequent trips home for Filipinos living in other Asian countries, particularly Malaysia, Singapore and Hong Kong. Malaysia, Singapore and Hong Kong combined have a Filipino population of about 1 million and it is no coincidence the trio along with South Korea (which has a smaller Filipino population and is more an inbound tourism market) are Cebu Pacific’s four largest international markets. Cebu Pacific expects to attract with its initial Dubai service Filipinos working in both Abu Dhabi and Dubai, which are about 150km apart, as well as the other smaller Emirates that comprise the UAE. Mr Reyes said the carrier aims to eventually serve both Abu Dhabi and Dubai markets but selected Dubai first as it is the larger market. He pointed out that Abu Dhabi has a faster growing Filipino population. There is currently an average deployment of 550 new Filipino workers to the UAE per day, with Abu Dhabi now accounting for more of the new deployments than the more mature Dubai market. But Dubai still has a larger Filipino community and Dubai is also more convenient for the Emirates of Sharjah and Fujairah, where there are also Filipino communities. Dubai is also a bigger gateway. Cebu Pacific says its Dubai passengers will have the opportunity to self-connect to 41 destinations in the Middle East and Europe. But Cebu Pacific does not plan to partner with any other carriers serving Dubai and sees a sufficient local UAE-Philippines market to support a Dubai and Abu Dhabi flight without having to pursue any partnerships. Abu Dhabi could potentially be added to Cebu Pacific’s network in 2014 as the carrier takes delivery of additional A330-300s. Mr Reyes said the network plan has Cebu Pacific serving both of UAE’s main airports with one daily flight rather than expand the Dubai operation to a second daily flight. Malaysian long-haul LCC AirAsia X withdrew service to Abu Dhabi in 2010 as the route proved to be unviable despite local incentives. But the Kuala Lumpur-UAE market is much different as it is more an inbound leisure market rather than migrant worker or visiting friends and family (VFR) focused. Malaysia Airlines also dropped the UAE from its network in early 2012 when it discontinued service on the Kuala Lumpur-Dubai route. Cebu Pacific is now trying to secure from Philippine authorities the traffic rights for seven additional weekly frequencies to the UAE to support the opening of Abu Dhabi. In 2012 the two countries extended their bilateral agreement, opening up 14 additional weekly frequencies on both sides for a total of 28 weekly frequencies. Cebu Pacific was originally allocated all 14 additional weekly frequencies but Mr Reyes said that two weeks later the allocation was changed and Cebu Pacific ended up with only seven of the frequencies. PAL’s budget subsidiary AirPhil Express, which has also been looking at adding A330s and launching long-haul services in 2013 with the Middle East its main target market, ended up receiving seven of the frequencies while PAL held onto its original 14 frequencies. Cebu Pacific has been pushing for a ruling from Philippine authorities that would give priority to Filipino carriers that operate into the UAE with their own aircraft. PAL, determining several years ago that it could no longer compete in the UAE market, handed its Philippines-UAE traffic rights to Emirates and Etihad as part of a codeshare arrangement with both UAE carriers. Under the old UAE-Philippines bilateral with 14 frequencies for both sides, Emirates and Etihad each operated one daily flight with their own rights while Philippine authorities allowed the carriers to operate their second daily flight using PAL’s rights. Mr Reyes said this unusual transfer of Filipino carrier rights to UAE carriers is continuing and Cebu Pacific would like to see it stopped and for Filipino carrier rights to be given to Filipino carriers if a Filipino carrier is interested in using the rights to operate their own flights. Cebu Pacific also believes it is unfair for the PAL Group to control 75% of the available rights given that Cebu Pacific is now set to become the first Filipino carrier to serve the UAE in several years. 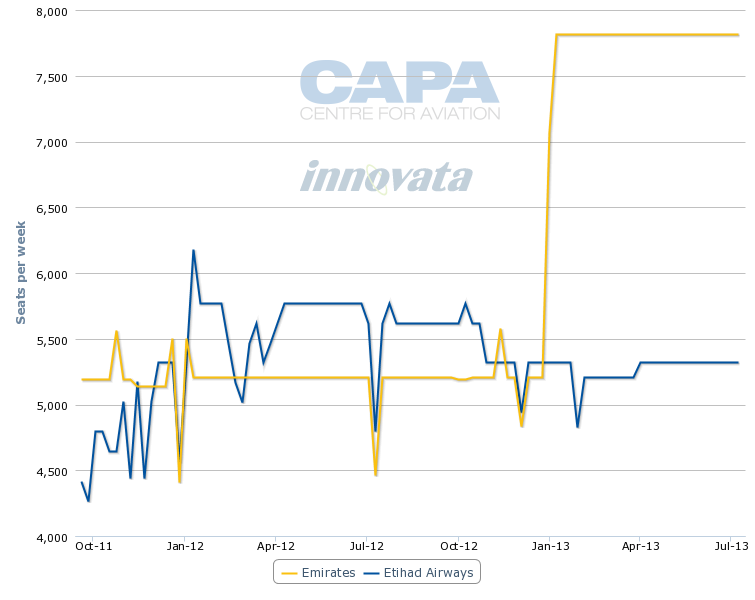 According to Innovata and CAPA data, Emirates currently has about 15,600 weekly seats at Manila while Etihad has about 10,600 weekly seats. This makes Emirates and Etihad the third and fourth largest foreign carriers at Manila, behind only Cathay and SIA. Cebu Pacific’s new long-haul unit also has Saudi Arabia and Kuwait in its network plan and is considering serving Bahrain and Qatar. At least one destination in Saudi Arabia is likely to be launched in early 2014. Saudi Arabia has the largest population of Filipinos in the Middle East, with over 1.5 Filipinos currently living in the Kingdom. But as the Filipino population in Saudi Arabia is more spread out than the UAE there is no single city pair as big as Dubai-Manila. Cebu Pacific is looking at serving the Saudi Arabian market with flights to up to three Saudi cities – Dammam, Jeddah and Riyadh. Philippine authorities have already allocated Cebu Pacific seven weekly Saudi Arabia frequencies which can be used for Jeddah and/or Riyadh. Dammam could be launched separately without counting against the Filipino carrier allocation as there are no restrictions on Filipino or Saudi Arabian carriers serving the Manila-Dammam market. Cebu Pacific management is not interested in tagging two cities or operating a triangle routing as it believes there is sufficient demand to operate directly to each market and does not like the complexity of combined routes. The carrier has not yet decided if it will operate daily to Jeddah or Riyadh or divide its allocation by operating to one destination four times per week and the other destination three times per week. SkyTeam member Saudia now operates 11 weekly flights to Manila, all using 747-400s, which makes it the seventh largest foreign carrier serving Manila. Six of the frequencies go to Riyadh while two of the frequencies go to Jeddah and three go to Dammam. As in the case of Dubai, Cebu Pacific sees ample opportunity for a second carrier in the Manila-Saudi Arabia market given the huge size of the Filipino population in Saudi Arabia and the ability of a LCC to stimulate demand. PAL previously served Riyadh, initially dropping service in 2006 as it pulled out of the Middle East after struggling to compete with Middle Eastern carriers. PAL resumed Manila-Riyadh in 2010 but dropped it again in 2011. Entering the market with a much lower cost base, Cebu Pacific believes it can succeed where PAL previously failed. Cebu Pacific also recently applied for traffic right in the Manila-Kuwait market. There are eight frequencies available for Filipino carriers to Kuwait. Hearings were held in mid-Jan-2013 but an allocation between Cebu Pacific and AirPhil/PAL has not yet been decided. Kuwait Airways currently serves Manila with six weekly flights via Bangkok. There are almost 200,000 Filipino workers in Kuwait, making it the fourth largest Filipino community in the Middle East after Saudi Arabia, the UAE and Qatar. Cebu Pacific has already been allocated two of the eight weekly frequencies available to Filipino carriers in the Philippines-Qatar bilateral. But the carrier is not keen to invest in a market in which it can only serve twice per week and is now trying to secure some of the six frequencies being held by PAL. As in the case of the Philippines-UAE bilateral, PAL has given its Philippines-Qatar traffic rights to Qatar Airways as part of a codeshare arrangement. Qatar currently operates 14 weekly flights to Manila, with eight flights using the traffic rights available to Qatari carriers and the other flights using six of the eight traffic rights available to Filipino carriers. As in the case of UAE, Cebu Pacific is hoping for a ruling to force PAL to return the rights it is only using for a codeshare under a scenario in which another Philippine carrier is willing to use the rights with their own aircraft. Such a ruling could ultimately impact the Gulf carriers and PAL’s relationship with the leading Gulf carriers. Bahrain-Philippines enjoys open skies so unlike with the other Middle Eastern markets there are no bilateral issues. But Bahrain is the smallest market with only about 60,000 Filipinos so it is unclear if there is enough demand to support a potential LCC. PAL codeshare partner Gulf Air currently operates one daily flight from Manila. Gulf Air’s network and schedules are now going through major changes as the struggling flag carrier restructures. Ultimately Cebu Pacific could end up serving all five Middle East countries once it reaches its planned fleet of eight A330s. With one aircraft expected to be allocated to the regional market, the carrier should be able to operate seven long-haul routes or more if some of the routes are served less than daily. One daily flight to the Middle East requires almost exactly one aircraft as flights between the Middle East and Manila take between eight and 10 hours – the latter also being at the end of the range of the A330-300 in high density configuration. Mr Reyes said the carrier expects to add at least two more long-haul destinations in 1Q2014 as the third and fourth A330-300 which Cebu Pacific has already committed to leasing are delivered. More long-haul destinations could also be added later in 2014, depending on delivery slots for Cebu Pacific’s third batch of aircraft. Cebu Pacific is still talking to Airbus and leasing companies about the final four aircraft in the eight-aircraft plan but the carrier prefers to build up its fleet and reach the economy of scale that eight aircraft provides as early as possible. While the Middle East market is the main focus, other network options are being looked at for the eight aircraft fleet including Australia and the US. But for Australia, Cebu Pacific flights are contingent on the Australia-Philippines bilateral being extended while for the US they are contingent on the Philippines being upgraded to Category 1 status. Mr Reyes said the current Australia-Philippines bilateral, which is based on seat capacity rather than frequencies, only has enough room to support a daily A320 flight. Cebu Pacific is only willing to launch a route to Australia if it has the flexibility to operate a daily A330 flight. To enter a market with two or three weekly A330 flights and potentially be stuck at a limited schedule if there is no change in the bilateral makes the route not worthwhile pursuing given the high initial costs involved with starting a long-haul route. Cebu Pacific is hoping Filipino authorities can engage Australian authorities and extend the bilateral. If the bilateral is extended significantly, Cebu Pacific sees sufficient demand to potentially serve both Melbourne and Sydney with daily A330 flights. There are currently almost 400,000 Filipinos living in Australia, making it the sixth largest overseas Filipino community in the world. The Australia-Philippines market is now served daily by PAL and four times weekly by Qantas. PAL splits its service between Sydney and Melbourne with four weekly frequencies allocated to Sydney and three to Melbourne. Qantas only serves the Sydney-Manila route. The US has the biggest overseas Filipino community at over 3.4 million. The US is also the biggest and has traditionally been the most lucrative long-haul market for PAL, which serves Los Angeles, San Francisco, Honolulu and Guam. But PAL for several years has been unable to expand in the US and more recently has been unable to switch existing US flights to its new fleet of 777-300ERs because the Philippines is stuck in Category 2. Philippine aviation authorities have been working on trying to regain Category 1 status for the last couple of years. While there is some hope an upgrade could occur this year, it is uncertain when this will occur as prior expectations of a near-term upgrade failed to materialise. Cebu Pacific has been interested in the US market for several years, particularly Guam as Manila-Guam can be served with its existing A320 fleet. But its interest in the US market has increased with the launch of its long-haul division. Mr Reyes said that Cebu Pacific is now studying entering the US market with wet-leased aircraft, which would be allowed as long as the wet-lease operator is from a Category 1 country. He says the study includes looking at the cost and feasibility of wet leasing an A320 for Guam as well as wet-leasing a widebody for Hawaii. The idea would be to get a head start in operating to the US with wet-leased aircraft and then switch to Cebu Pacific aircraft once Category 1 status is secured. Cebu Pacific was recently authorised by the US DOT to serve the US with wet-leased aircraft. The carrier automatically became entitled to serve all US points listed in the Philippines-US bilateral including Guam, Saipan, Honolulu, Los Angeles and San Francisco. Wet-leasing aircraft is an unusual step for a LCC as it is costly. Cebu Pacific will only enter the US market with a wet-lease operation if it believes it can offer a fare that is low enough to stimulate demand and not simply take market share away from existing carriers. Once Cebu Pacific fully studies the costs and benefits of the possible wet-lease operation, it could elect not to go forward with US services until Category 1 is secured. Regardless, Cebu Pacific is ultimately interested in serving Guam with its A320s and Hawaii with its A330s. Mainland US markets such as Los Angeles and San Francisco could only be served if Cebu Pacific acquires a new type of widebody aircraft. The carrier is talking to Airbus and Boeing about A350s and 787s but these aircraft would not be delivered in the near to medium-term and once delivered Cebu Pacific may elect to keep them on shorter long-haul routes. So far long-haul LCCs have discovered very long routes such as Asia-Europe and Asia-North America are challenging given the high cost of fuel. Cebu Pacific’s long-haul unit for now is focusing on its A330 fleet and routes of under 10 hours. The carrier is committed to operating A330s through at least the middle of next decade as its initial leases are for 12 years. Mr Reyes said Cebu Pacific has decided on a single-class configuration for its A330-300s with 436 economy class seats in a 3-3-3 layout. This is only four seats below the maximum 440 seats that the A340-300 was certified for. To save weight, Cebu Pacific has opted against installing in-flight entertainment systems (IFE), believing its passengers will come with pre-loaded iPads and laptops (the carrier will consider renting iPads for a fee). It is not planning to follow Scoot in offering wireless IFE but has signed up for wifi capability from OnAir. Cebu’s apparent decision to forgo a premium seat goes against the decisions of AirAsia X, Jetstar and Scoot. It also signals that Cebu is potentially not interested in entirely replacing PAL. While Cebu’s expansion into long-haul services complicates its model, the carrier seems to want to avoid straying into other elements of the full-service model such as business class and codeshares. AirAsia and Jetstar have shown there is demand for a more spacious seat priced more competitively than other carriers’ premium classes. AirAsia X has found the greatest success with its premium cabin, going as far as to offer lie-flat seats whereas Jetstar and Scoot offer recliner-style seats (the two may be restricted to not offering a more superior product that would cannibalise the premium product on their full-service parent companies). Beyond demand, a premium cabin can be justified by making better use of space. With flights typically hovering at 80% load factors, a question emerges whether to let that remaining 20% of floor space go unused or put in a new product and attract a new type of passenger, as AirAsia X did. The potential for a premium cabin on Cebu is even greater since PAL does not have as comprehensive a premium product as other full-service Asian carriers. But the Philippines also has a relatively small premium market compared to other Asian countries, a factor which may persuade Cebu to stick with the intended all-economy configuration. Cebu Pacific also expects a larger point-to-point market than that seen by AirAsia X to and from its Kuala Lumpur hub and what Scoot and Jetstar see from their Singapore hub (Jetstar also bases its A330s in Australia). As a result, Cebu Pacific will not rely on transit traffic as much as AirAsia X, Jetstar or Scoot. AirAsia X works closely with its short-haul sister carrier while Jetstar’s long-haul division promotes connections with Jetstar short-haul as well as parent Qantas and some foreign carriers. Scoot already interlines with Tiger Airways, Singapore Airlines and SilkAir and is now looking for partners outside the SIA Group as the point-to-point market alone in Singapore can only support a handful of long-haul LCC routes. Cebu Pacific’s new long-haul division will offer connections to domestic flights operated with its fleet of A320 family aircraft and ATR 72s. Cebu Pacific has timed its Dubai flights, which will take off from Manila at 16.40 and arrive back in Manila at 11.40, to connect in both directions with at least 15 domestic routes. But Cebu Pacific's long-haul unit at this point is not looking at interlining with other carriers. Cebu Pacific sees interlines – even budget-minded light interlines – as too expensive and complex to justify, especially given the huge size of the point-to-point markets catering to the huge population of overseas Filipinos. Cebu Pacific currently has only one interline arrangement: a niche one-way deal with Hawaiian Airlines that gives Hawaiian access to one domestic route, Manila-Laoag, an area in the north Philippines where most Hawaiian Filipinos are from. As the Philippines is a unique market it is not surprising the country’s largest carrier has opted to go with a new twist to the still emerging long-haul low-cost model. The rapid growth over the last several years of Cebu Pacific as well as a few smaller low-cost carriers has seen the Philippines achieve unprecedented levels of LCC penetration. The domestic LCC penetration rate in the Philippines is now about 85%, which is unmatched among the world’s other medium and larger size domestic markets. Given the size of its population working outside Asia, there are similar huge opportunities for LCCs in the Philippine long-haul market. Cebu Pacific will be the first long-haul LCC to try to tap this market but will almost certainly not be the last as other Filipino carriers as well as foreign long-haul LCCs will be similarly attracted. By targeting under-served markets such as the Philippines-UAE while also using its small fleet of new widebodies to lower seat costs on some of the world’s busiest international short-haul routes, Cebu Pacific is entering the long-haul low-cost market conservatively and wisely. A larger widebody fleet and network than currently envisioned, and potentially a spin-off of its long-haul unit, are likely outcomes in the medium to long-term.